Well you can! 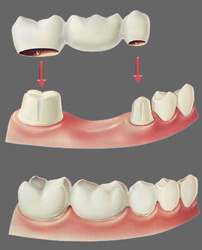 At Delroy Park Dental Care, we may have the perfect solution for you in a fixed dental bridge. Give us a call and we’ll be happy to schedule an appointment for you so the doctor can take a look at that space and recommend treatment options. If you would like to explore dental bridges further, call our clinic to arrange a consultation or to receive more information.